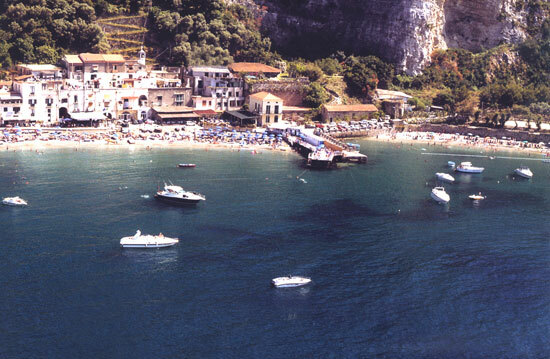 A little further in the west, towards the tip of the peninsula lies the beach Baia di Puolo. Just a few houses line the bay surrounded by steep cliffs and fisher boats are rocking gently on the waves offshore. This beach is not very big, yet it offers more space than some of the other bays of the region and it is therefore a popular destination. The small fishermen's village also offers some restaurants and lidos, so you can spend some nice hours relaxing on the beach here at this bay. The seawater is clean and there are great regions for diving alongside the cliffy coast. The beach is sandy in parts, but parts are also covered with fine pebble. The little village can be reached with the city bus line or in a few minutes with the car. Parking is available at a charge. View at google maps "Nice beach in a bay and a great diving region west of Sorrento "